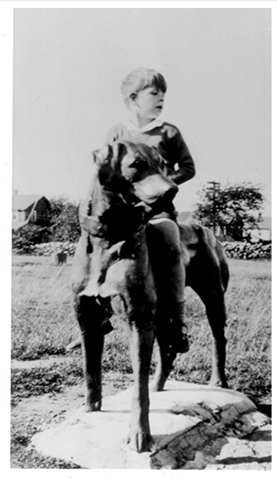 Stephen Stiles astride the dog statue at the farm, circa 1933 (from Robbins Farm Park, A Local History, by Oakes Plimpton). The Robbins History Project, funded by the Friends of Robbins Farm Park, consists of two parts at the park: the House and the Dog. Granite blocks will mark the location of the House of our community’s great benefactor, Farmer Nathan Robbins. The Dog will be a replica of his dog statue that was beloved by the children of Arlington, for whom he donated his farm to become our park. View a complete History Project presentation, with history and detailed drawings (pdf). 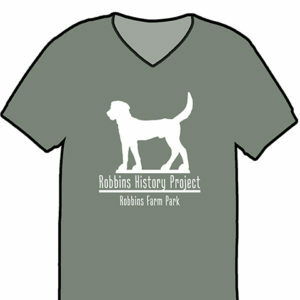 The Friends of Robbins Farm Park is offering Tee Shirts as a premium gift for donations of $50 to the History Project. Visit our Join/Donate page for more information. Tee-shirts are available as a thank-you gift for a $50 contribution toward funding the Robbins Farm History Project. Get more information. 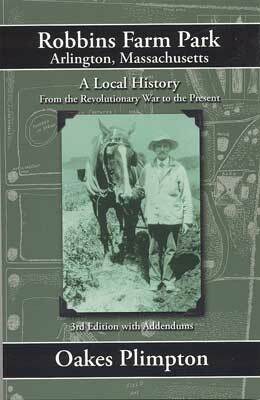 This book is a treasure trove of Arlington history, telling the fascinating story of the life of Nathan Robbins, gentleman farmer and true Yankee eccentric. It recounts how his beloved farm came to be preserved as an equally beloved Park, now well known for the remarkable views it affords of Boston. Oral histories, letters, newspaper articles, and over 65 illustrations and photos document the story of the Robbins’ unusual marriage, his love for the land and a disappearing way of life he shared with the children who played there. This new edition includes new stories and pictures and brings us up to date. Written by FORFP founder and historian Oakes Plimpton.